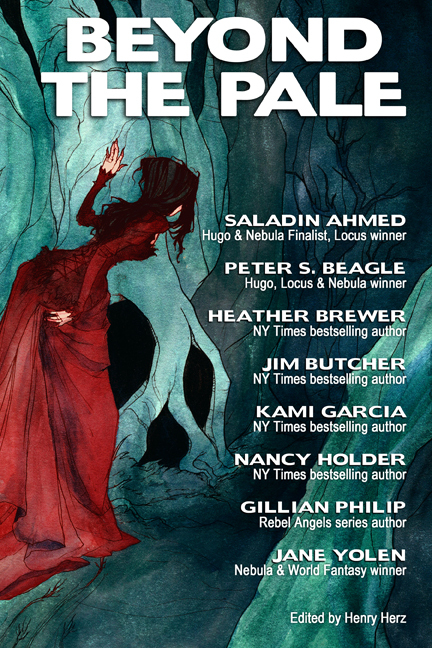 Editor and author Henry Herz’s new anthology, Beyond the Pale, features short fiction from Jim Butcher, Gillian Philip, Saladin Ahmed, Peter S. Beagle, Jane Yolen and more! Beyond the Pale is available from Birch Tree Publishing, and is already getting glowing reviews from some of our community’s brightest rising stars. Henry was kind enough to write a guest post for Little Red Reviewer that contains excerpts from some of the stories (which is awesome unto itself!). Henry writes sci-fi and fantasy books for kids. His picture book Monster Goose Nursery Rhymes will be published by Pelican in 2015. He is editor of a YA fantasy anthology, Beyond the Pale, which will be available August 1. Take a moment, close your eyes, and recall a few stories that truly engaged you as a reader. Now doff your reader’s hat, and don your analytical writer’s hat, You’ll recognize certain writing techniques reliably employed by the pro’s. Using senses other than sight, evoking emotions, using rich voice, taking action, and describing scenes vividly are powerful tools for creating characters you care about, immersing you in a fictional yet believable world, and raising the stakes for readers. All well and good, you say, but how do I master those methods? Just as a lion is the product of all the zebras it’s eaten, a writer is the product of all the books he or she has read. Reading the works of skilled writers is a fabulous way to hone your craft. So, if you want to master the above techniques, a great place to start is to read examples of them. The following excerpts from Beyond the Pale, illustrate how to effectively employ these tactics. The following scene from “Hooves and the Hovel of Abdel Jameela” by Saladin Ahmed does a wonderful job of pulling the reader into the story by using senses other than just sight. Go outside and close your eyes. Concentrate on all the sounds and scents you were previously ignoring – the birds chirping, the slight tang of ocean air, the rustling of leaves in the wind. Including more sensations in your writing makes your story feel more real. Immerse readers in the world that you have created. The following excerpt from “The Children of the Shark God” by Peter S. Beagle introduces us to the protagonist quickly, but in a way that makes us care about what happens to her. Readers want characters with whom they can sympathize (Harry Potter) or revile (Tywin Lannister) or both. We must give readers insight into what makes protagonists tick. What motivates them? What are their aspirations? Readers want to get to know our characters. In this passage, we learn that Mirali, while not conventionally beautiful, is a kind soul who works hard for her parents and is appreciated by her community. We quickly start to become invested in what happens to her. The following excerpt from “Shadow Children” by Heather Brewer sends a chill down my spine every time I read it. Through sheer courage and selflessness, teen Dax has just saved his six year-old brother Jon from the clutches of shadow creatures in Jon’s closet. Dax slowly nodded his head, even though everything was about as far from okay as it could get, and looked from the closet to the sunny day outside. Out the window, he could see the neighbor kids playing soccer. To any onlooker, it would seem like an ordinary, normal day. As she turned around, Jon peered over his mother’s shoulder at Dax, who froze. Jon smiled and offered a wave. Shadows lurked in his eyes—the darkest that Dax had ever seen. In this scene from “Frost Child” by Gillian Philip, the horror takes a moment to sink in, as the reader realizes what the child witch is feeding her newly-tamed water horse. These two examples horrify readers by revealing a previously undetected detail that causes them to wince and recoil upon recognizing the implications. But of course, we have many emotional arrows in our writing quiver we can employ – humor, love, determination, anger, and so on. Invoking emotions makes your characters more human (even if the characters are not themselves human). Your readers will more easily relate to them and care about what happens to them. The voice chosen by the author has a profound impact in how readers interpret the story and view the characters. In the following excerpt from “The Adventures of Lightning Merriemouse-Jones” by Nancy and Belle Holder, the voice and sentence length quickly convey the time period and lighter tone of this comic horror. That would be instructive, but rather dull; and so we will tell you, Gentle Reader, that the intrepid Miss Merriemouse-Jones was born in 1880, a wee pup to parents who had no idea that she was destined for greatness. Protective and loving, they encouraged her to find her happiness in the environs of home—running the squeaky wheel in the nursery cage, gnawing upon whatever might sharpen her pearlescent teeth, and wrinkling her tiny pink nose most adorably when vexed. vexed, abode, and repute, place the reader in a Victorian setting even without the reference to 1880. The narrator’s voice also clearly sets a tone of felicity and humor. Just as the narrator has a distinct voice, each character can have their own voice to help readers distinguish them and to convey aspects of their personality. Voice is a terrific tool to help readers get to know and appreciate your characters. Of course, interesting characters and engaging dialog are important, but writing gripping action scenes is a skill all its own. A skill that has been mastered by Jim Butcher, as shown in the following excerpt from “Even Hand”. chassis of a gorilla. Their heads were squashed, ugly-looking things, with wide-gaping mouths full of shark-like teeth. The sounds they made were deep, with a frenzied edge of madness, and they piled into the corridor in a wave of massive muscle. The new military AA-12 automatic shotguns are not the hunting weapons I first handled in my patriotically delusional youth. They are fully automatic weapons with large circular drums that rather resembled the old Tommy guns made iconic by my business predecessors in Chicago. One pulls the trigger and shell after shell slams through the weapon. A steel target hit by bursts from an AA-12 very rapidly comes to resemble a screen door. A well written action scene thrusts the reader smack into the middle of the story. It’s another way to evoke emotion and empathy for characters. The protagonist in this story is actually a crime lord. Even so, the writer wants you imagining yourself behind the defensive barrier, wielding a shotgun, and praying the torrent of lead will prevent the demonic onslaught from reaching you. The following excerpt from Jane Yolen’s “A Knot of Toads” illustrates another technique for writing better stories by describing a scene so vividly that the reader feels immersed in it. The evening was drawing in slowly, but there was otherwise a soft feel in the air, unusual for the middle of March. The East Neuk is like that—one minute still and the next a flanny wind rising. I headed east along the coastal path, my guide the stone head of the windmill with its narrow, ruined vanes lording it over the flat land. Perhaps sentiment was leading me there, the memory of that adolescent kiss that Alec had given me, so wonderfully innocent and full of desire at the same time. Perhaps I just wanted a short, pleasant walk to the old salt pans. I don’t know why I went that way. It was almost as if I were being called there. For a moment I turned back and looked at the town behind me which showed, from this side, how precariously the houses perch on the rocks, like gannets nesting on the Bass. Then I turned again and took the walk slowly; it was still only ten or fifteen minutes to the windmill from the town. No boats sailed on the Firth today. I could not spot the large yacht so it must have been in its berth. And the air was so clear, I could see the Bass and the May with equal distinction. How often I’d come to this place as a child. I probably could still walk to it barefooted and without stumbling, even in the blackest night. The body has a memory of its own. Halfway there, a solitary curlew flew up before me and as I watched it flap away, I thought how the townsfolk would have cringed at the sight, for the bird was thought to bring bad luck, carrying away the spirits of the wicked at nightfall. If, like me, you find the setting calling to you, making you long to walk that stony shore, then the author has succeeded in pulling you into their world. What do these writing techniques have in common? Using senses other than sight, evoking emotions, using rich voice, taking action, and describing scenes vividly all make the characters and setting feel more real. The readers want to be taken on a journey to another place and time. They want to do it with characters they’ll care about and whose company they’ll enjoy. Help readers feel like they have a stake (vampire pun) in what is transpiring. You can order your copy of Beyond the Pale now. Better writing through reading! 1 Response to "Prose Lessons from the Pro’s, a guest post by Henry Herz"
What a great collection of stories! I am definitely reading this one. Thanks!